Duke started out as Brown’s Schoolhouse in 1838, but, through several name changes and a move to Durham, became Duke University in 1924 in honor of Washington Duke, a wealthy tobacco farmer, and his family. His son, James B. Duke, established a $40 million endowment to benefit hospitals, orphanages, three colleges, and the university. Also in the early 1920s, Duke gained its nickname of Blue Devils after a college newspaper contest. No clear winner emerged, so the newspaper staff decided for themselves. Although climbing to the top of Duke University’s Chapel Tower, 210-feet high, is reserved for university employees, the Chapel is a magnificent neo-gothic built in the 1930s. Gaze up at the tower, or step inside to see the 77 stained glass windows. Non-denominational services are held every Sunday, offering an opportunity to hear the magnificent pipe organs and the Chapel Choir. In the living laboratory that is the 7,000 acre Duke Forest are an unlikely group of animals. For more than 50 years, the Duke Lemur Center has been studying and leading the conservation charge for this most endangered mammal in the world, native only to Madagascar. Sarah P. Duke Gardens, established in the mid-1930s, is one of the top ten public gardens in the U.S. and open year-round. Basketball fans will want to stop in at the Duke Basketball Museum and Sports Hall of Fame. Go Blue Devils! For nearly 50 years, North Carolina has been the top sweet-potato grower in the United States. 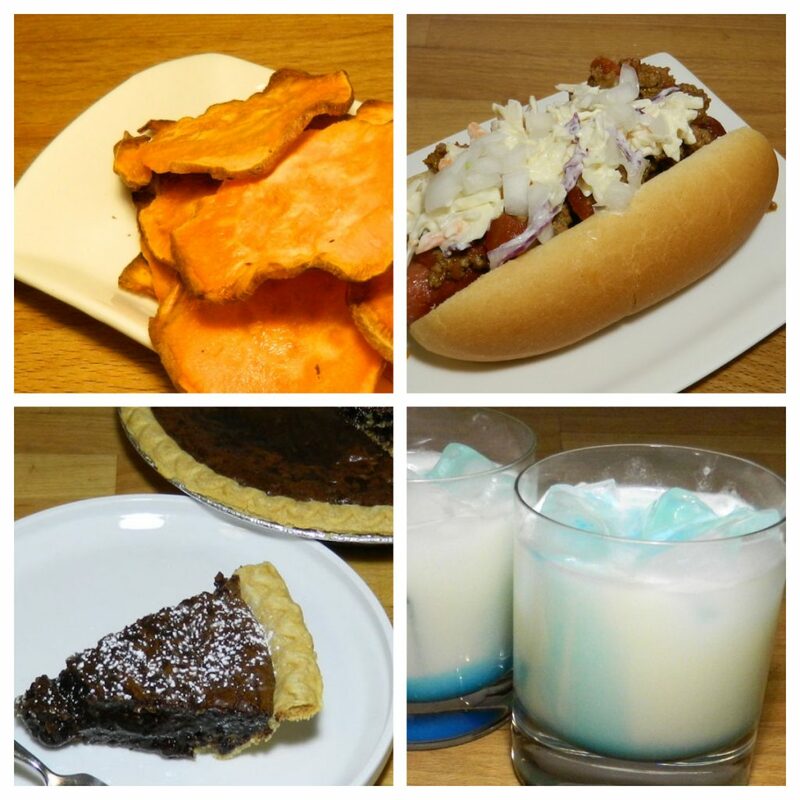 Baked Sweet Potato Chips sounded like the perfect compliment to a Carolina-style hot dog. The chips are easy to make, but watch them carefully. They can go from brown edges to burned very fast (speaking from experience!). What are the best toppings for a hot dog? It all depends where you are! A Carolina-Style Hot Dog has just three toppings: no-bean chili, cole slaw, and onions; mustard is optional. Kind of like a brownie, a little like fudge, Tarheel Pie celebrates the state nickname originating from early years producing tar, pitch and turpentine for the U.S. Navy. The state’s plentiful pine trees were a resource the Navy needed. During the Civil War, the nickname became a source of pride for North Carolinian soldiers. But back to the pie—it only looks like a dark, sticky mess, but, boy, is it tasty. I was very skeptical of drinking a Coach K Breeze after seeing the ingredients (vodka, lime juice, simple syrup, heavy cream, an egg white), but the smooth, creamy flavor was just right. With a hint of blue curacao on top, this is a winner, just like the coach. Remember Washington Duke, who made his fortune in the tobacco industry? American Tobacco, once the largest tobacco producers, was his company. Now the old tobacco warehouses serve a new purpose: a thriving entertainment and restaurant district as well as the grounds for the Durham Bulls minor league baseball team. Looking for unusual shops? Head to Ninth Street, just a few blocks from the Duke campus, offering an eclectic mix of unique stores, restaurants and coffee shops. Two sodas have their beginnings in North Carolina: Pepsi in 1898 and Cheerwine, a wild-cherry flavored soda, in 1917.